The Pacific golden-plover (Pluvialis fulva) belongs to the family of plovers and lapwings, the Charadriidae. The Pacific golden-plover species is distributed in northernmost Asia, western Alaska, western North America, eastern Africa, Indian subcontinent, southeast Asia, China, Taiwan and Australia. These plover species breed in the Arctic tundra. These Pacific plovers are monotypic species. The Pacific golden-plover (Pluvialis fulva) is a medium-sized plover, measuring 20 to 25 cm in length and weighing 100 to 230 grams. The wingspan is 60 to 70 cm. Both the male and female look similar. The adult Pacific plovers in the breeding plumage have bold golden spots on the crown and hinderneck. The face is black. The forehead is white. The white broad supercilium curves behind the ear coverts to the sides of the neck. The upperparts are black with bold scaly gold spots. The underparts in the breeding Pacific golden-plover are black with white stripe along the flanks. The vent region is mostly white. The bill is black and the irises are dark brown. The legs are black. In the wintering plover the black is lost and is replaced by shades of brown. The underparts are whitish. The upperparts are dark brown, heavily marked with bright creamy or golden scale-shaped spots. The legs are pale brown. The plover call is a whistling "klu-eeuh" sounds. 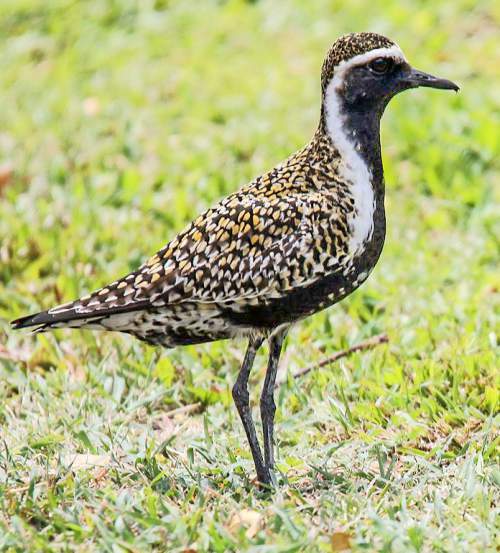 The Pacific golden-plover species is distributed in northernmost Asia, western Alaska, western North America, eastern Africa, Indian subcontinent, southeast Asia, China, Taiwan, Australia, New Zealand and Papua New Guinea. 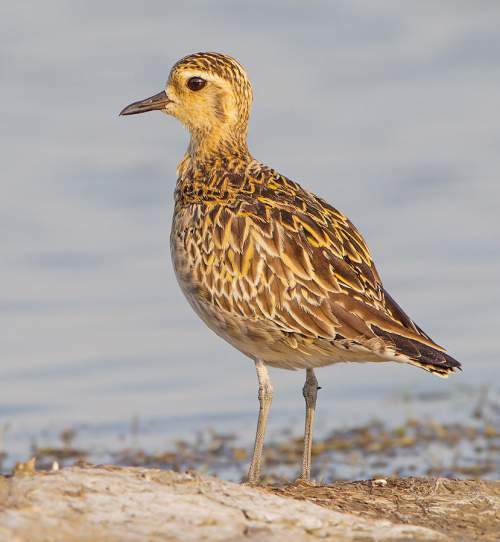 In India, these Pacific golden-plover species are distributed in the states of Rajasthan, Haryana, Uttar Pradesh, Madhya Pradesh, Gujarat, Maharashtra, Karnataka, Goa, Kerala, Tamil Nadu, Andhra Pradesh, Odisha, West Bengal and northeast India. The Important Bird and Biodiversity Areas (IBA) of the Pacific golden-plover species in China is Ebi Nur and Kuytun River. The IBA in Japan are Awase tidal flat and Lake Kasumigaura. The IBA in Malaysia is Sadong-Saribas coast and in Mongolia is Dashinchilen Bayan Lake. The IBA of Pacific golden-plover species in USA are Northwestern Hawaiian Islands and James Campbell National Wildlife Refuge. The IBA in Philippines are Manila Bay and Mactan, Kalawisan and Cansaga Bays. The IBA of the Pacific golden-plover in Myanmar is Gulf of Mottama. These Pacific golden-plover species have low forest dependence. They normally occur in altitudes from 0 to 100 meters. The artificial ecosystems and habitats of these species include agricultural lands and fallow fields. The natural ecosystems and habitats of these plover species include, tundra grasslands, boreal shrublands, subtropical and tropical mangroves, coastal marine lakes, freshwater lakes, intertidal mud flats, marshes and sandy, pebble and shingle shorelines. The diet of the Pacific golden-plover consists mainly of invertebrates. Molluscs, crustaceans, polychaete worms, insects and insect larvae, spiders and berries are their primary food. The Pacific golden-plover also feed on lizards, birds' eggs, small fish, fruits, seeds, leaves and other plant matter. These plovers forage on the moist mud or sand by gleaning, pecking or probing. The breeding season of these Pacific golden-plover species is from May to July in the boreal summer of most of their breeding range. The nesting sites are located in inland Arctic habitats, including dry positions in shrub tundra, montane tundra and hummocks. The nests of the Pacific golden-plover are usually shallow scrapes in the ground, lined with lichen or moss. The clutch usually consists of two to four eggs. Both of the parents take turns to incubate eggs. The chicks hatch out after 26-27 days of incubation. The chicks are precocial. These Pacific golden-plover species are migratory birds, breeding in northernmost Asia and Alaska and flying south for wintering. Non-breeding Pacific plovers leave the breeding grounds in Siberia and Alaska in mid-July for wintering. The breeding adults depart in August and the juveniles leave in September and October. The wintering grounds are spread over Africa, south and southeastern Asia and Australia. Some Pacific golden-plovers migrate along a broad front while others migrate in small groups. Some birds from Alaska may cross the Pacific Ocean and may use several islands enroute as stopover sites. The return migration commences in March and the plovers reach the breeding grounds in May. The global population size of the Pacific golden-plover (Pluvialis fulva) is estimated to number 190,000 to 250,000 individual birds. The overall population trend of the species is considered to be decreasing. In most of its range, this plover species is reported to be common and locally uncommon. The generation length is 5.6 years. Its distribution size is about 8,240,000 sq.km. Habitat alteration and destruction, hunting, disturbance from human activities, climate change and severe weather are the main threats that are endangering the survival of this plover species. The Pacific golden-plover (Pluvialis fulva) does not approach the thresholds for being Vulnerable either under the range size criterion, or under the population trend criterion or under the population size criterion. The IUCN (International Union for Conservation of Nature) has categorized and evaluated the Pacific plover species and has listed it as of "Least Concern". The CITES (Convention on International Trade in Endangered Species of Wild Fauna and Flora) status is ‘Not Evaluated’ for Pacific golden-plover (Pluvialis fulva). The Pacific golden-plover is closely related to American golden plover (Pluvialis dominica) and was earlier considered conspecific. Current topic in Birds of India: Pacific golden-plover - Pluvialis fulva.